Last year, a friend of mine won two passes to go to the Pacific NW Bookseller’s Association Fall Tradeshow and decided to take me along. We got to attend many great panels, and got to go to the author’s dinner, where we got to ask questions of published authors and take away autographed copies of one of their books. One of the best parts, though, was the tradeshow itself. My friend and I both collected large bags of recently published and soon-to-be published books, and I am just now getting around to working through them. 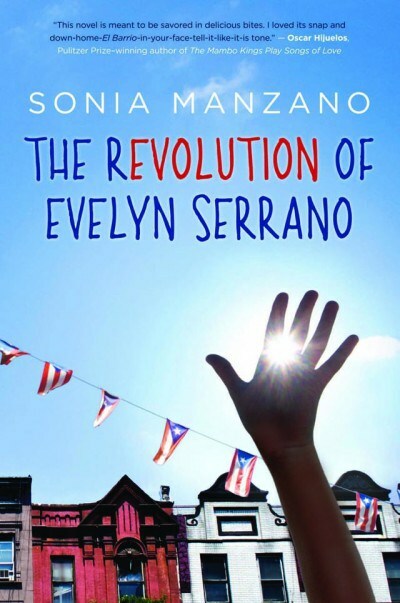 One of the books I got was The Revolution of Evelyn Serrano by Sonia Manzano. This book tells the story of a young woman, Rosa Maria Evelyn del Carmen Serrano, living in a Puerto Rican neighbourhood in New York. She makes everyone call her Evelyn because it is the Whitest-sounding of her names. The story is about learning to love her family and growing in her understanding of the world as the Young Lords tried to improve the neighbourhood in 1969. A really amazing thing about the book is the history that it tells. The Young Lords were a gang in Chicago that turned into a Puerto Rican rights organisation in the late 1960s. They fought gentrification in Chicago, sought social uplift for poor Puerto Ricans living in the US, and advocated for an independent Puerto Rico. The media has largely re-imagined them — like the Black Panther Party before them — into a dangerous group of hoodlums, but they wanted to create change and bring justice to their communities. Though they are an important piece of the book, Revolution isn’t really about the Young Lords; it’s mostly the tale of Evelyn, her mother, and her grandmother learning to be a family as the neighbourhood changes around them. Overall, I really enjoyed this book. The Spanish sprinkled throughout the text lends realism to the conversations and characters. There is humour aplenty, but it also is sombre in some parts. Most of all, it is real in the way that some things are: though I did not grow up a poor young woman in a Puerto Rican neighbourhood in the 1960s, I have lived in poverty. I have heard poetry that seemed to be about me, and told me something true about the world and how I move in it. I have been in moments of social justice community where everything seems to be on the verge of change, and you’re riding high on the shared feeling of possibility around you. This is a fictionalised version of events, but that doesn’t stop it being true in the most important ways.